Earlier this year, I participated in a Big Think survey for Singularity University alumni to help define what it takes to lead disruptive innovation in an organization. Due to the disruptive nature of exponential technology, we need to adopt some new approaches to managing innovation. Below are four excerpts from the report. You can access the full report, “The 2015 Exponential Leaders List” on Big Think’s website. QUESTION 1: Which three of the following tools or practices do you think are most important in creating disruptive innovation? Respondents most frequently cited an ability to experiment and fail fast as one of the most important tools or practices to achieving such change, making it the only choice to be cited by a majority of participants. 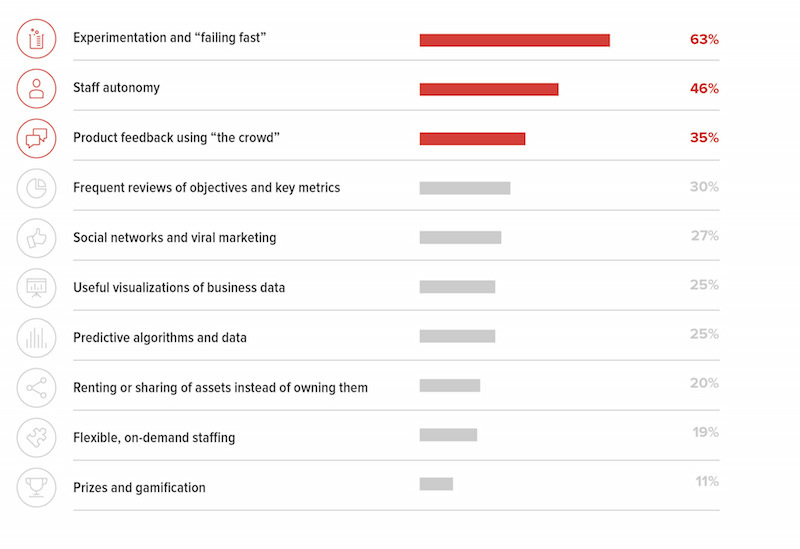 Staff autonomy and product feedback using “the crowd” were the second and third most cited requirements, painting a picture of short development cycles, ground-up innovation, and rapid readjustment. QUESTION 2: Which three [disruptive innovation tools or practices] do you think are being used least effectively in your organization? 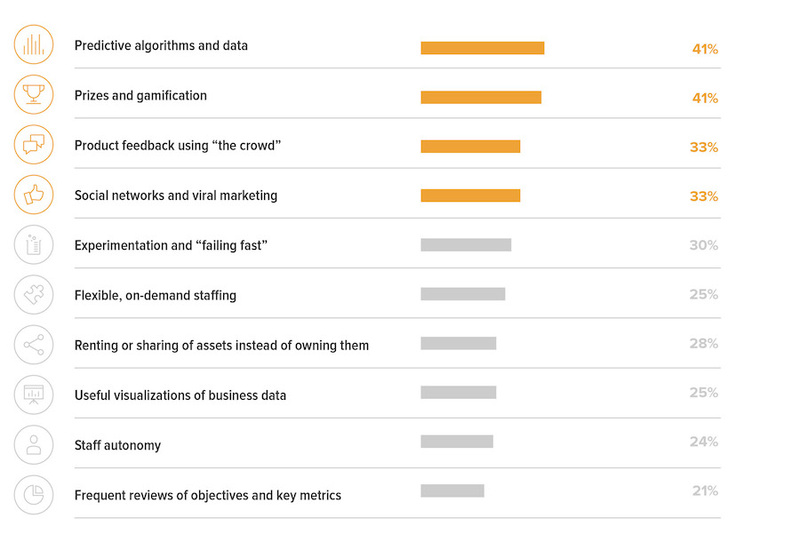 Respondents also identified practices at which their organizations could improve. The top two of these were predictive algorithms and prizes and gamification, both cited by over 40 percent of respondents. QUESTION 3: Which four of the following chief executives of young companies do you think are most effective in achieving disruptive innovation? Respondents cited leaders of companies such as Kickstarter, Uber, and Airbnb as most effective in driving disruptive innovation by a wide margin, with Yancey Strickler, Travis Kalanick, and Brian Chesky each being cited by about two out of five respondents. 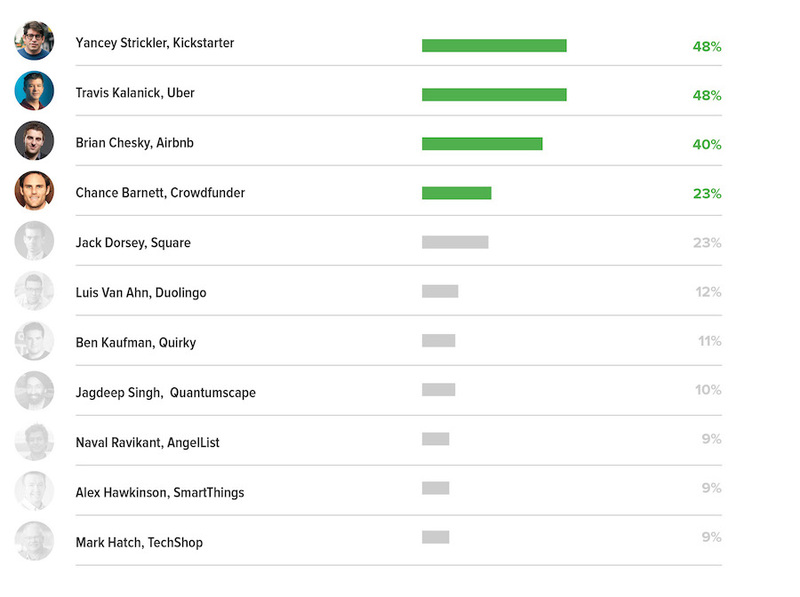 Chance Barnett, CEO of Crowdfunder, was cited by 23% of respondents. Question 4: Which of the following technologies do you think will have the most disruptive impact on business in the next three years? 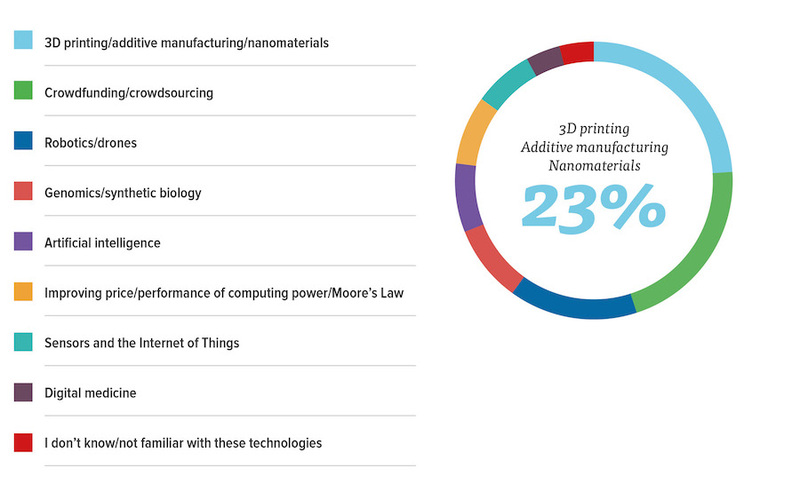 3D printing, Internet of Things, and Artificial Intelligence seem best positioned to drive disruption in the next three years. 2 of 4 survey answers could not have been more wrong — Three D printing clearly little to no impact and overhyped and Kalanick at Uber was a disaster as a leader. Please find writers with real leadership analysis.